To protect the supremacy of the rule of law, you had us fighting for a former national security adviser alleged to have shared money meant to arm our troops among his cronies while insurgents killed and maimed innocent Nigerians. By the time an Igbo separatist with a penchant for using strong language against other tribes named Nnamdi Kanu was finally released on bail after several court orders to that effect, he was dubbed a ‘hero’ and had state governors scrambling to take pictures with him. A chief justice of Nigeria having up to a billion naira in cash at some point would ordinarily be condemned to the pits of hell in the court of public opinion. But, instead, he sat back and watched a massive outcry by Nigerians against his unconstitutional removal from office. You President Muhammadu Buhari are quite toxic — probably the most toxic we have ever had. In standing up for what is right, you have had Nigerians fighting the cause of their own enemies. How bad can things get? I am sure you must have heard the words ‘selective’ and ‘hypocritical’ used severally over the last four years to describe your anti-corruption crusade. Those words were mainly used to describe a campaign which seemed to focus more on crippling vibrant members of the opposition and those of the APC whom you either fell out with or bore grudges against. But happenings over time have given rise to another set of words — ‘cowardly’ and ‘dubious’. Silence or refusal to address pressing issues gives rise to conspiracy theories, and, when that happens, people choose and stick with the narrative they feel is nearest to the truth. Right now, Mr President, it is practically impossible to shoot down claims you are scared of prosecuting Lawal Daura, the former head of the DSS, and Sani Baba-Inna, the arrested aide de camp of your wife Hajiya Aisha Buhari. Lawal Daura as boss of the DSS is said to have done a lot of dirty jobs for the Presidency and had his agents at the houses of the Senate president Bukola Saraki and deputy Senate president Ike Ekweremadu weeks before the closure of the National Assembly by the DSS. No one in the Presidency reprimanded Mr Daura for his actions. Or did the President not know? Well, the unofficial narrative is that he was working for Saraki. Baba-Inna, on the other hand, is accused of defrauding people in the name of the first lady to the tune of N2.5bn.Family members claim he did take money but it was from a stash he was keeping for Aisha Buhari and that he had already bought a house for one of her daughters in Maitama. Baba-Inna is believed to be in trouble now only because he got too greedy. The problem, Mr President, isn’t only that you may be scared of taking these people to court because of the highly incriminating evidence they may produce against you or your wife; it is also that we may find ourselves clamouring for their release if they aren’t charged to court. A video of Baba-Inna’s wife crying with her kids is guaranteed to kick-start a movement in that regard. No better situation justifies more the ‘dubious’ appellation of your war against corruption than that of former petroleum minister Diezani Alison-Madueke. Like most Nigerians, this woman called on the federal government to allow her return home and answer to the charges against her. But, of course, the EFCC insisted then that a trial in the UK was imminent. Mr President, about two years later, Diezani is yet to face trial in the UK or Nigeria. The EFCC chairman told Nigerians there were ongoing plans to extradite her in October 2017, and he repeated those same words a year and a month later in November 2018.The woman was pictured strolling on the streets of London months ago. Why don’t you want to bring her back? There is something no one is telling us and we’ll have to figure it out ourselves. Mr President, the more reason why the Diezani situation appears dubious is that the UK government promised to charge her to court, and that is not in doubt. But they back-tracked and kept mute ever since, while Ibrahim Magu has been giving us the same story. If anyone said you entered a deal for her to be let off the hook in the UK where nobody is ordinarily above the law and send Magu to deceive us with the same line always, how would you counter that?. Then there is, of course, the case of Patience Jonathan whose properties and monies are being seized without the EFCC as much as inviting her for questioning. If that same person said her husband sent former presidents and other emissaries to negotiate an immunity deal for them that involved some benefits going your way, what answer would you give? Consider this sir. The Jonathans were never a target until Dame Patience ‘stubbornly’ came out to claim monies found in the names of her aides. Instead of the woman running off to another country or seeking penance for disrupting a scapegoat manufacturing process, she sued the EFCC. She ought to have grown those balls from knowing deep down she was untouchable. I would have categorized under ‘dubious’ too the EFCC’s investigation of Governor Abdullahi Ganduje of Kano State, but ‘hypocritical’ is more fitting, especially after you told Kadaria Ahmed at your appearance on ‘The Candidates’ before the elections that you ‘didn’t know the technology used’. Fayose and others definitely don’t enjoy the special privilege of being exonerated by the commander-in-chief himself. You had already investigated Governor Ganduje and had an outcome. 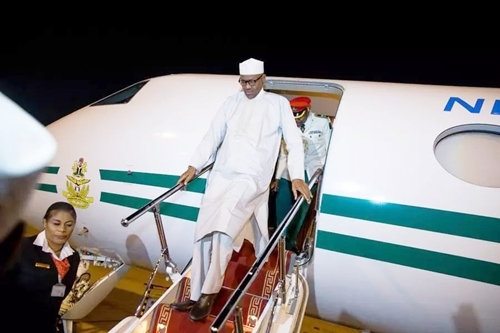 The least you can do is prevent the EFCC from wasting precious taxpayers’ money in the name of sending videos overseas to foreign experts.Well,not that anyone truly thinks the EFCC independent.The Chairman appeared on live TV with a ‘Sai Buhari’ 2019 lapel pin on his suit. That, and how you have stuck with him despite his indictment on corruption by the DSS, would make just about anyone on the EFCC’s radar appear a victim. This is toxic.